Philadelphia - US Mint Gold Bars. One important fact does stand out; that an influx of gold bars had occurred sometime during the week of January 11th. 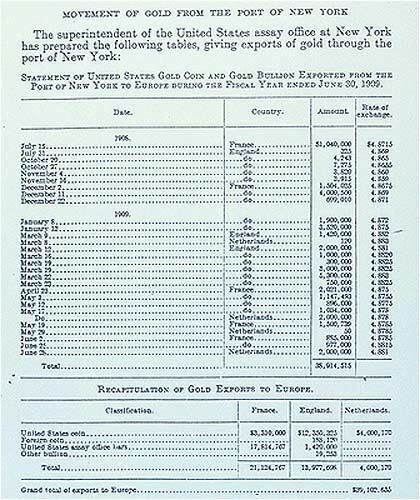 The attempt by bankers to acquire and ship gold bars is discussed in newspaper articles which appeared on January 11th and in newspaper accounts which purportedly described shipments of gold on January 13th [See: Gold Market and Export Activity, January, 1909]. The acquisition of additional gold bars is also reflected in the the January 16th export reports. Pay particular attention to the dates of these articles. No Engagements Announced To-Day, but Movement Expected to Continue. Notwithstanding that sterling exchange rates for a time to-day were at the highest level touched on the present movement, no gold was engaged for export to Europe. Negotiations were in progress, however, and bankers stated that it was a practical certainty that shipments would be made on Saturday's [January 16's] steamships. [Emphasis supplied] Whether this gold will go to France or England is as yet undecided, but it was said that from present indications, the movement will be to England. If such shipments are made, they will be the first to that country since last spring. The sterling market was extremely uncertain to-day, demand bills selling as high as 8755, declining to 4.8730, then recovering to 4.8740. The early advance was attributed to the rise in the English bank rate. It was asserted to-day that whatever gold is exported at the close of the week will be in coin, as the supply of bars available at the Assay Office is now exhausted, so far as export engagements are concerned. The National City Bank has purchased $2,000,000 of gold bars in Philadelphia for export purposes. Although foreign exchange rates eased slightly yesterday and no engagements of gold were announced, negotiations were entered into by leading international bankers for shipment to Europe later in the week. These will be made probably tomorrow. ... It developed yesterday that the National City Bank had purchased from the Philadelphia mint, through the Fourth [Street] National Bank of Philadelphia, $2,000,000 gold bars which are expected to form part of the big shipments planned for tomorrow [Saturday, January 16]. The gold bars used at the Philadelphia mint are of finer gold than those of New York, but this will only make them more suitable for export. There is much mystery as to the destination of the new shipments. Paris for months has been accumulating gold and the Bank of England yesterday advanced its discount rate, which would indicate that it was in the market for American gold. International bankers were of the opinion that the gold would go to England, as that country has lost virtually all of the gold arriving at that center for more than five months. Paris secured all offered in the open market. Of the total $250,000,000 Russian loan, to be floated in Paris, it has been announced that London bankers will take $30,000,000. Very little will be paid over in cash, as most of it will be used toward taking up part of the  Russian treasury bonds falling due in May. In order to take care of the Russian loan, Paris has been accumulating gold for months, and virtually the whole of the $100,000,000 Transvaal gold that arrived by the Cape Town steamers has been shipped to Paris. This has left the gold reserves at London in a certain sense barren. Mystery as to where the National City got its bar gold was solved when it was announced that the bars had come from the Philadelphia Mint, having been engaged by the Fourth Street National Bank of that city several days ago [Emphasis supplied.] when the local supply became exhausted. GOLD EXPORTS - The National City Bank has purchased $2,000,000 gold bars from the Philadelphia Mint through the Fourth Street National Bank of that city for export this week. [emphasis supplied] The foreign exchange market yesterday was irregular but generally firm, and at a level at which gold coin could be exported or gold bars secured in Philadelphia for export at a profit, the high price of demand sterling offsetting the expense involved in bringing the metal from that centre to New York. In fact, there would be no new engagements or gold shipments related to new engagements during the next seven weeks [See: "Statement of United States Gold Coin and Gold Bullion Exported From the Port of New York", ENLARGED here]. 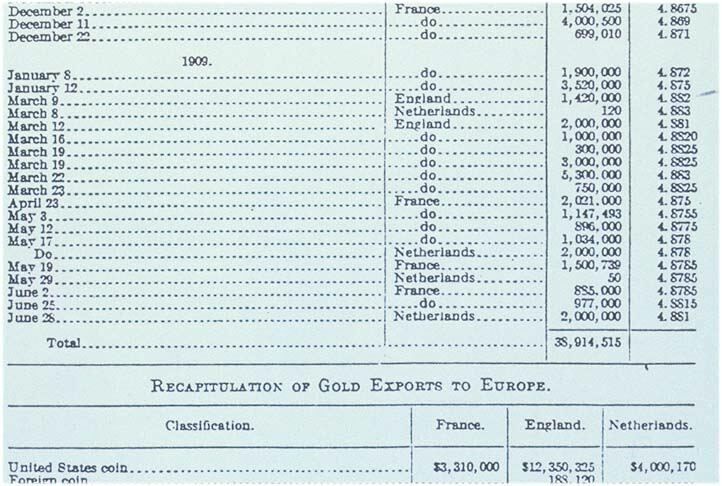 After the $3,000,000 American Gold Eagle engagement of January 12th, the next engagement to Europe occurred on March 9, 1909 - a $1,420,000 gold bar engagement (composed of bars derived entirely from the New York Assay Office 2 ) exported to England. Out of concern for the lack of gold bars in the U. S. Government's possession, an order forbidding further sales of gold bars for export by governmental agencies was issued by the Director of the Mint, with the approval of the Secretary of the Treasury, shortly after the March 9th engagement.3 From March 10th to March 23rd, $12,350,000 in gold coin was shipped to Europe (specifically England). Gold bars did not become available again until the embargo was lifted with the April 23rd, $2,021,000 gold bar engagement to Paris. These bars were also drawn on the New York Assay Office and, again, exhausted their supply.4 The lack of gold bars had clearly suppressed the gold export movement and was of national concern. The Philadelphia gold bars referred to above, therefore, were intended for engagements that had already been "officially" shipped! Naturally, the bankers would leave the destination of these forthcoming, purportedly new, shipments a great "mystery" and even be "of the opinion that the gold would go to England." New York Assay Office - Out of Bars. ... Exports of gold coin to Paris are now to be made as the supply of gold bars at the assay office has been exhausted in the trade demands of jewelers. This is the first time that coin has been taken for shipment [to Europe] in several years. [emphasis supplied]. The international monetary situation this week was brought into greater prominence than heretofore through the resumption of gold exports from New York to Paris and Argentina. The recent steady hardening in sterling here and the fall in Paris indicated clearly that an outgo was inevitable by the month of January. But this is nothing unusual, as gold exports have frequently occurred in this month in past years. The significance of the movement, however, was in the fact that exchange reached a point that permitted of shipment of gold coin, something very rare of late years. [Emphasis supplied.] . . .
1A total of $2,000,137.97 in gold bars for export was drawn from the U. S. Mint at Philadelphia in January, 1909, and they were the only bars drawn for export from the U. S. Mint at Philadelphia for the entire calendar year 1909. Reports from the Superintendent of the Mint at Philadelphia, Bureau of the Mint, Letters Received, #287 865 and #287 866, U. S. National Archives, Washington, D. C.
2March 9, 1909 report of the United States Assay Office, Ibid, #277 673. 3New York Times, April 24, 09, 12:1; National Archives, Records of the U. S. Mint, Press Copies of Letters Sent, Number 266, March 15, 1909.